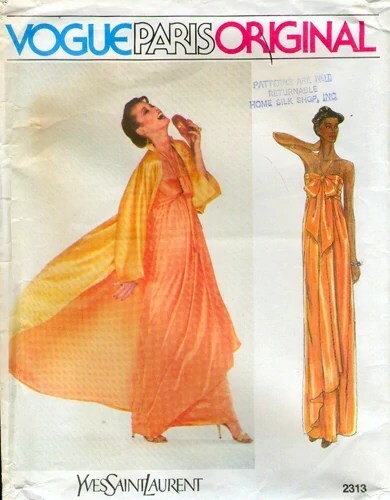 From McCall’s 4046 by Halston (1974). This week, some favourite disco patterns! The term ‘disco’ is a little nebulous. Disco music was popular from the mid-1970s to about 1980. Its huge popularity led to an anti-disco backlash that’s come to be symbolized by Disco Demolition Night, a.k.a. the ‘Disco Riots,’ which took place in the summer of 1979 (see Jo Meek, “Earth, Wind and Pyre,” and Joe Lapointe, “The Night Disco Went Up in Smoke”). Studio 54, the famous New York City nightclub that effectively stands for disco hedonism today, was open from 1977 until 1986. In this slideshow, you can see Andy Warhol partying at the club with Bianca Jagger, Liza Minelli, and Halston, as well as Diana Ross, Deborah Harry, and even a young Tom Ford. 1. Vogue 2870 – Lanvin, 1973. Modelled by Karen Bjornson. Bjornson, who is virtually ubiquitous on later ’70s Vogue Patterns, was Halston’s house model. The (fantastic) photo makes the design look like a jumpsuit, but the pattern is actually for evening separates: palazzo pants with no side seams and a halter top with a wide midriff band that gives a cummerbund effect. 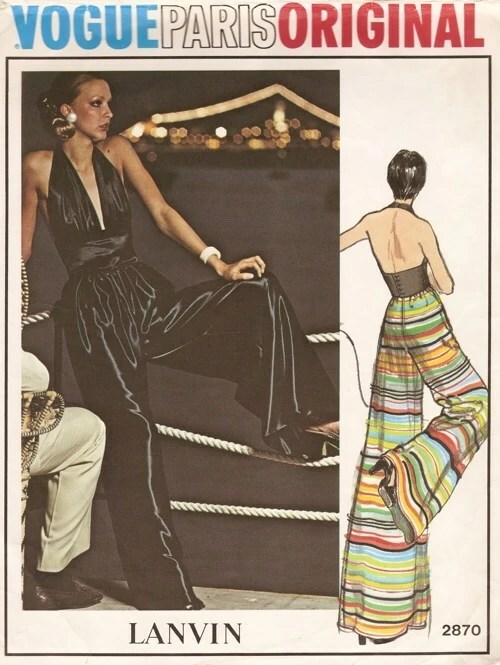 Vogue 2870 by Lanvin (1973) Evening top and pants. Image: Vintage Patterns Wiki. 2. Vogue 2014 – Givenchy, 1978. Modelled by the young Gia Carangi, the late, queer supermodel who was brought back to the spotlight by the HBO movie Gia starring Angelina Jolie. This gorgeous evening dress has a crisscrossed halter neck and calls for an eighteen-inch tassel down the back. I have this one in my collection and plan to make it sometime in a silk or viscose jersey, but I think I need to learn to make tassels first. Vogue 2014 by Givenchy (1978). Evening dress for stretch knits. Image: Vintage Patterns Wiki. 3. Vogue 2173 – Chloé, 1979. No disco collection could be complete without this design by Karl Lagerfeld for Chloé. The one-shouldered evening dress comes with a reversible contrast shawl. I don’t know why, but to me this is the perfect late seventies-early eighties colour combination. 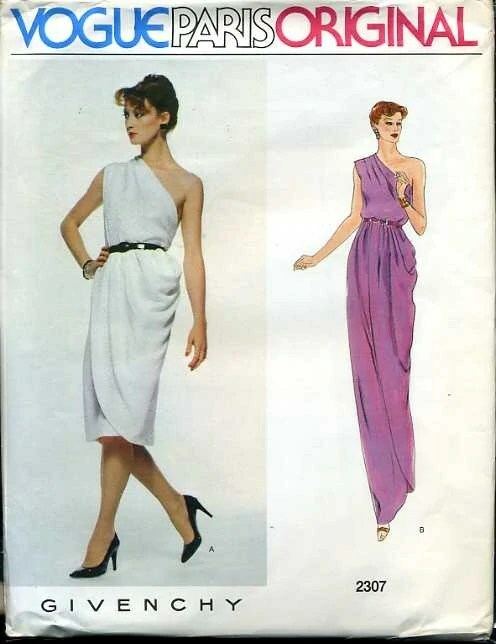 Vogue 2173 by Chloé (1979). Evening dress, tie, and shawl. Image: momspatterns. 4. Vogue 2307 – Givenchy, 1979. Modelled by Tara Shannon. Another beautifully fluid Givenchy design, with the asymmetrical, one-shouldered bodice balanced by draping at the opposite hip. This is another one in my collection; I have a length of deep purple chiffon (originally used in a Hallowe’en costume) that’s just enough to make the cocktail version, but I haven’t yet found the occasion where I could get away with that much purple chiffon. 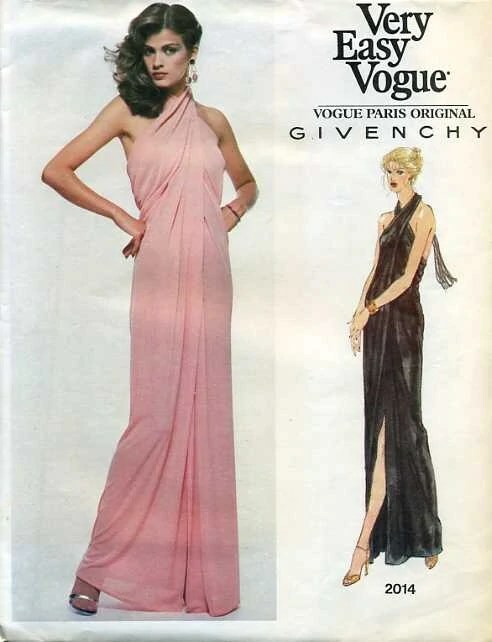 Vogue 2307 by Givenchy (1979). One-shouldered cocktail or evening dress. Image: Vintage Patterns Wiki. 5. Vogue 2313 – Yves Saint Laurent, 1979. Modelled by Tara Shannon. A fabulous opera coat and evening dress ensemble with tie-halter and bow bodice. I love the sorbet colours, graphics and over-the-top drama of this pattern. Vogue 2313 by Yves Saint Laurent (1979). Evening dress and coat. Image: Vintage Patterns Wiki. 6. Vogue 2375 – Gianni Versace, 1980. Not a true jumpsuit as I thought (thanks, Dustin!) but a halter neck top and pants with tapered legs, side draping and matching jacket. Check out the illustration’s matching sandals and tone-on-tone, contrast satin cummerbund. Vogue 2375 by Gianni Versace (1980) Jacket, top, and pants. Image: eBay. 7. Vogue 1014 – Yves Saint Laurent, circa 1982. My notes say this is a top and pleated harem pants but, as the photo shows, it definitely has a jumpsuit effect when made in a single fabric and worn with the top tucked in. 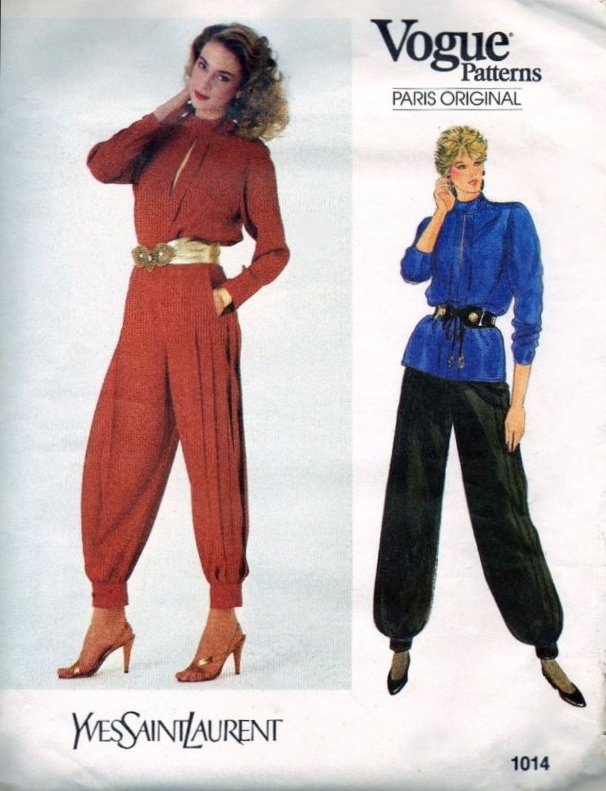 It’s interesting to see cuffed and pleated harem pants in the wake of the recent draped harem pants trend. Are we having a disco moment? Vogue 1014 by Yves Saint Laurent (ca. 1982). Top and harem pants. Image: eBay. 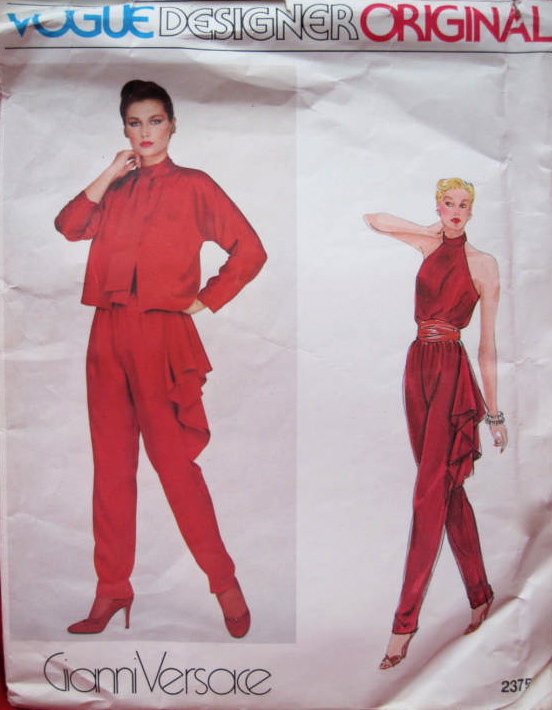 I stumbled on your blog looking for Halston patterns via google images, and found your post on Christian Lacroix for Vogue patterns. That post answered many questions I had about those patterns, so thankyou! About the Versace pattern (I was lucky enough to win a copy on ebay a few months ago), it is a jacket, top and pants pattern, and the cummerbund is not included. Similar to the Lanvin pattern (which I just bought on etsy a few days ago! ), it just appears to be a jumpsuit. But don’t you just love the side drape? Beautiful! Glad you found the Lacroix post helpful! Many thanks for clarifying the details on the Versace pattern — I’ve updated the post with the correct description. I do love the side drape.. Sounds like you have an enviable disco pattern collection! Although, like most amazing patterns, it is hard to find. You should have seen my shortlist! This period is pure indulgence for me, I’m sure I’ll find an excuse to cover it again soon..